Okay, I have decided to comment everyday I check out your blog. This card is absolutely fun! You continue to amaze me with your talent. Thank you for providing me tons of inspiration. I love the dog stuff as well. Anybody would be touched to receive those gifts. They are a work of art. Great card, colors, and I *love* those selectively rounded corners–very creative! This is totally AWESOME!!!! I love this stamp set and your card is amazing! Soooo cute! I love the greens and blue’s together! Wonderful card, MJ! TFS! 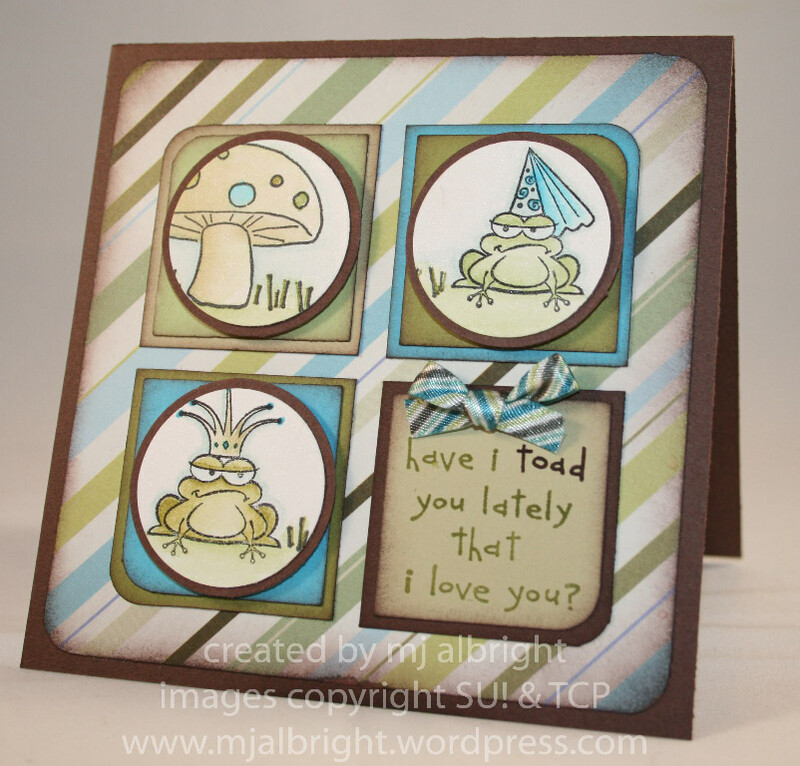 so very cute, love how you used different color cs for the base of the images and how you rounded the outside corners, very cute stamps, all work together great! I love this card. Your take on Taylor’s Cupcake Challenge is really great. I love the rounding of certain corners to make it all hold together but still feel like separate little pictures. And the frogs are definitely cute! TFS! Great card ! The froggies are adorable ! I love those frogs, they have so much personality! And the paper is perfect to go with ’em!